Sign-up using the form or call us at 815-385-9240 to take advantage of this exclusive offer. Your Optometrist in McHenry, IL. Call us at 815-385-9240 today. Welcome to McHenry Optical. Dr. Howard Sadofsky and the McHenry Optical team strive to provide the finest in optometry services. We invite you to browse our website to learn more about our optometry services, and invite you to join our patient family by scheduling an eye exam appointment at our McHenry office. McHenry Optical is a full service eye and vision care provider and will take both eye emergencies as well as scheduled appointments. Patients throughout the McHenry area come to McHenry Optical because they know they will receive the personal attention and professional care that is our foundation. Dr. Sadofsky and our team are dedicated to keeping our patients comfortable and well-informed at all times. 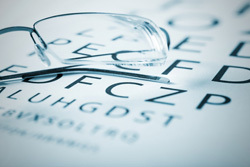 At McHenry Optical, we will explain every exam and procedure and answer all of our patient's questions. Additionally, at McHenry Optical, we offer vision financing options and will work with vision insurance providers to ensure good eye health and vision care for all of our patients. Our one-on-one approach to optometry makes Dr. Sadofsky and the McHenry Optical staff the eye and vision care providers of choice in the McHenry area. Our McHenry optometrist offers the following services: complete eye exams, contact lenses, glasses, glaucoma testing, and pre- and post-operative care. For a complete list of services, visit our services page or call our McHenry office at 815-385-9240. At McHenry Optical, we are dedicated to providing high-quality optometry services in a comfortable environment. Call us at 815-385-9240 or schedule an appointment today online. At McHenry Optical, each member of our vision care team is selected by Howard Sadofsky based upon his or her experience, professional demeanor, and dedication to providing personalized care to our optometry patients. Our entire McHenry optometry staff is committed to ensuring the comfort and satisfaction of each and every patient. We will do our best to accommodate your busy schedule by finding appointment times that meet your needs. Our knowledgeable staff at McHenry Optical will work with you to help you understand your vision insurance coverage and provide financial alternatives to ensure you get the best vision care possible. We know that you have a choice when it comes to McHenry optometry, so we strive to provide comprehensive eye exams, a great selection of glasses, and personalized care. Contact lenses will be delivered directly to you with no shipping fees for orders of $127 or more. Dr. Sadofsky is a graduate of Boston University and Illinois College of Optometry and has been in private practice at this location since 1989. Known for his thorough exams and his attention to detail, Dr. Sadofsky has a loyal patient base. He also welcomes new patients. "I LOVE Mchenry Optical. Very caring doctor and staff, especially Trina. I got my very first ever contacts yesterday, and it took close to one hour for me to get the hang of it,and Trina helped me every step of the way and never got impatient with me!! I recommend them to everyone!!!!" "Outstanding service, outstanding staff. Very knowledgeable & Trina put me back in style with a pair of cool frames." "Our family will only go to McHenry optical. Dr. sadofsky does a thorough and comprehensive exam and Trina and Jacquie are excellent opticians. If you want quality and service I highly recommend them." "The absolute best experience I have had at an eye doctor. I had gone to another local Dr. and after multiple visits I was told I could not have contacts. After one visit at McHenry Optical, Dr. Sadofsky was able to find out my exact prescription and fit. For years I had been using a prescription that was too strong for my eye, Dr. Sadofsky discovered it and now I have 20/15 vision!" "Very nice and supportive people. Repair of my broken glasses under warranty has been effortless."